Sometimes a room goes through so many changes, you actually start to forget some of them! I am so pleased with the end result here. My heart is happy when I look in this room now. It came together because I finally figured out what I really liked and what worked in this space. I had made so many, "eh, not quite" decisions. That's just me. I'm never a slam dunk idea girl when it comes to decorating my home. It's usually trial and error. I decided to go through my tear outs and Pinterest boards and take a hard look at what I was consistently attracted to. I realized that a lot of the ideas I'd been trying to put together weren't consistent with that. Once I figured it out, it really came together! I love open shelving. That was a must. 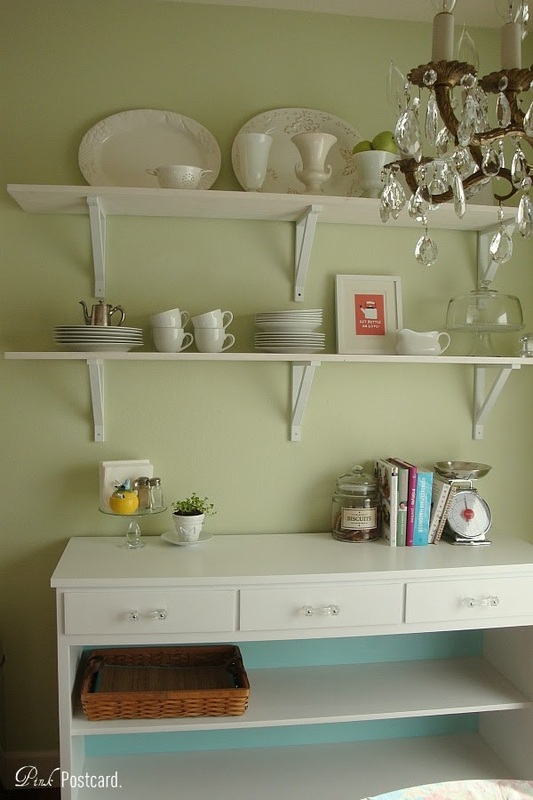 It quickly and inexpensively filled up a large wall space while also giving us lots of extra storage in a pretty way. The top shelf was for some of my favorite platters that don't get used on a daily basis but I love to see. Milk glass and ceramic vases add some nice shape. 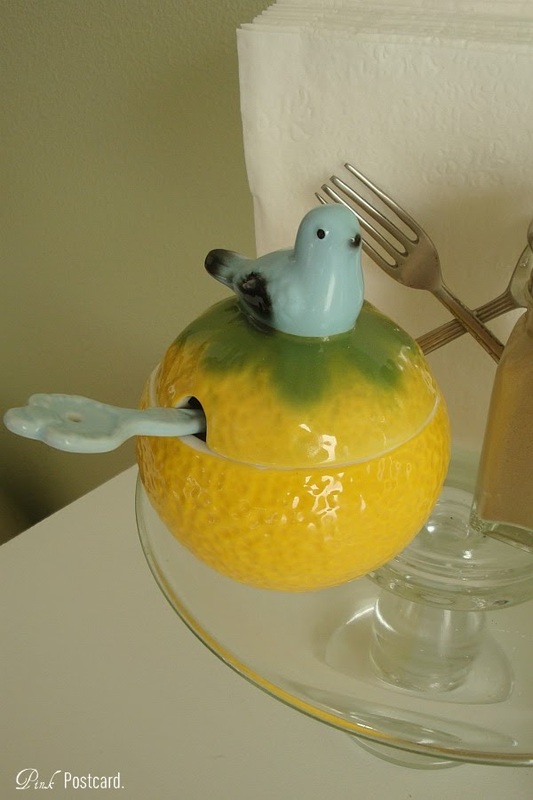 The little concrete bird was from my friend Lois. I'm sure I will continue to fluff these shelves, but for now, I like how it's working. The bottom shelf now stores all of our everyday dishes. I think it will be nice having it right next to the table. Plus, if we have guests over, there's no questions on where everything is. The art! 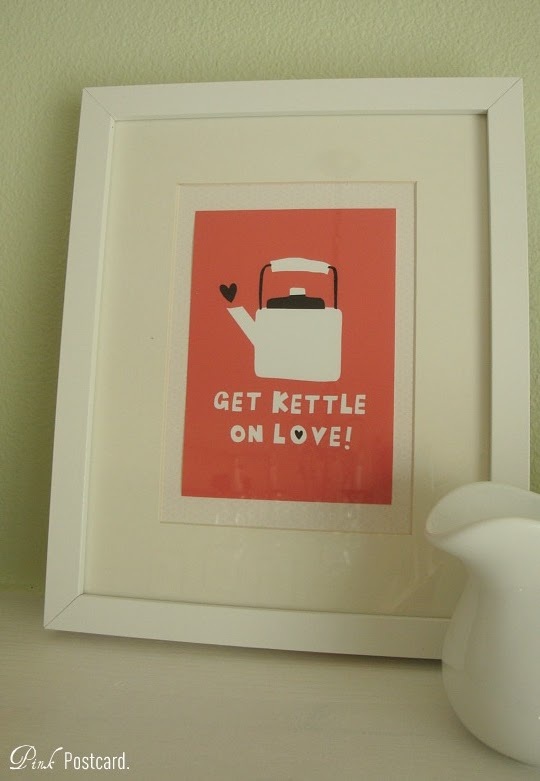 Amy Walters, from the U.K., designed this adorable print, and I've had it on my Pinterest board for awhile. I love the pink back ground, the English sentiment...it was supposed to take several days to get here, but it was only about 4!! woo hoo! Check out some of her other adorable and quirky art in her shop. So fun. The print you see here now also comes in a larger size. 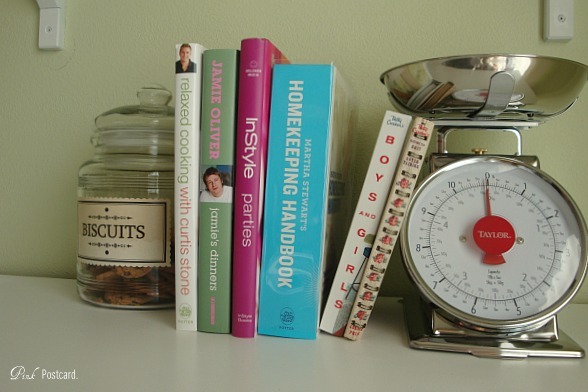 I used the scale and our new cookie jar as bookends for some of our cookbooks. I have a lot more, but I just put a few out for now. I found this jar when I was out thrifting a few weeks ago. I loved the style of it. Since it was just clear glass I knew a fun label would really perk it up. I designed this one on one of my software programs. It's printed on regular paper, but I stained it with coffee prior to printing it. A little Mod Podge, and I now have a cute jar for the goodies. Let me know if you have any issues printing this out or saving it to use! 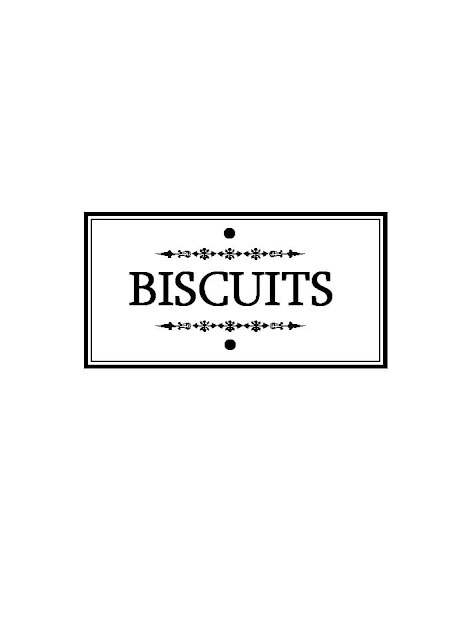 A scalloped edge scissor was what I used for the edging on my label. 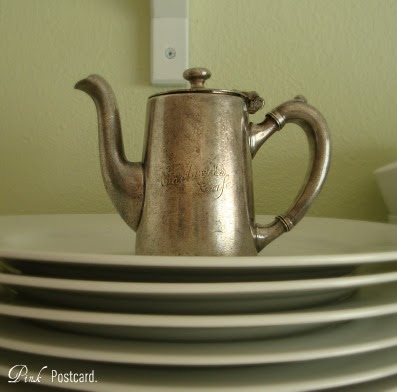 I also added in my vintage creamer. My mom gave this to me years ago. Engraved on the front is 'Edelweiss Cafe'. I also started storing our table necessities on this little glass pedestal. Napkins, sugar bowl, and salt and pepper. The sugar bowl was a major splurge from Anthropologie, but it adds so much character, I've never regretted this purchase! I just adore the dainty little spoon!! I still have more primping to do and figuring out what to do with all of the new found storage space, but like I said- just loving this space right now! The basket on the shelves holds our place mats. I hope to add more baskets in there soon. I am busy prepping for my show in 3 weeks! LOTS of goodies I can't wait to show you. Simply beautiful... I love your ideas and design for decorating.. I love white and this is perfect! Looks great - nice job! How I wish we had some wall space for shelving. A clean and inviting white kitchen! Love the vintage accents. The area looks great Denise! I love all of the white. You have great accessories up there. Beautifully done! 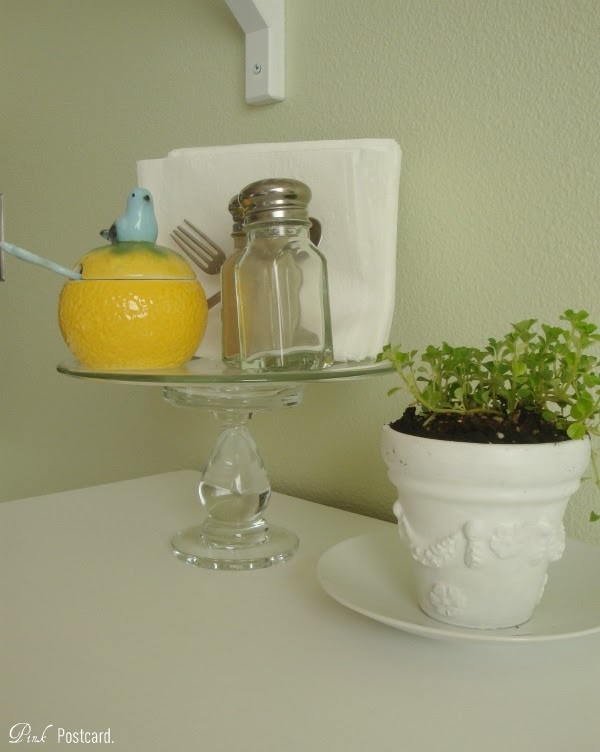 Love the glass pedestal idea for the everyday items!! Your room is so cute!! I would be happy here!! Love, love, love. It turned out so nice. I love all the accessories and great decision on the anthro sugar bowl. So sweet! Love it, Denise! 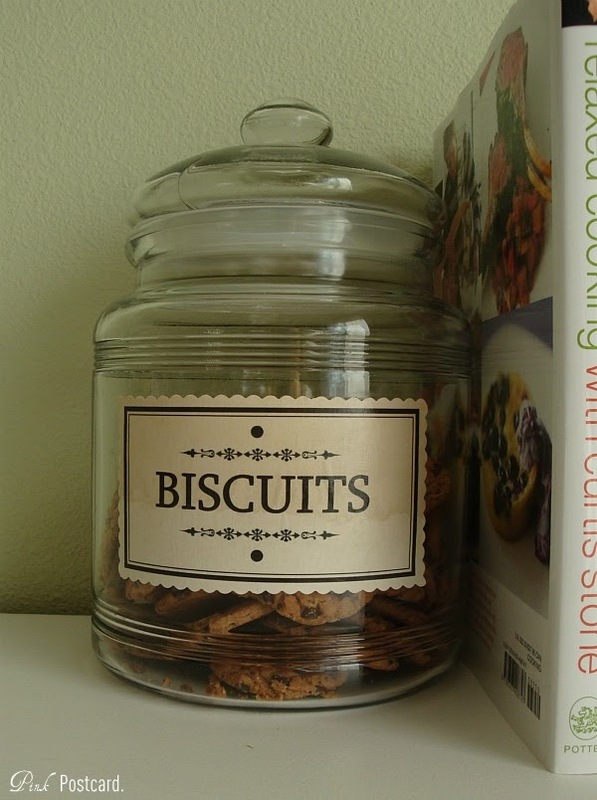 Great detail on the biscuit jar! I have been watching a lot of shows from the BBC lately and it puts me right back to the accent! Wish I could see it in person! 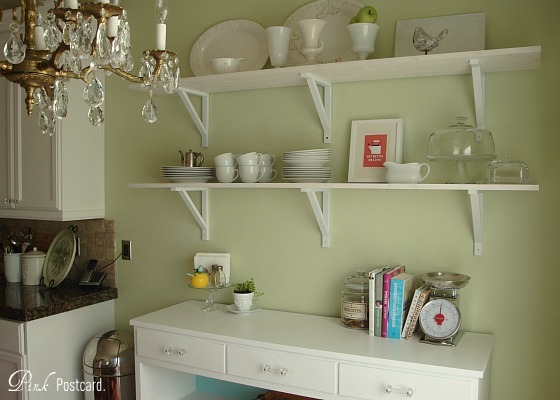 Very pretty, love the open shelving too! The sugar bowl is so adorable, no wonder you love it! Hi Denise! I love what you've done with your nook! Just the right amount of vintage and whimsy. Very cute! I love that you stained the paper with coffee then printed on it. I need some paper for a project and this would work wonderfully. Thank you!